Taken on Daedalus Reef in the Egyptian Red Sea. Corals belong to a group of animals called Cnidarians. 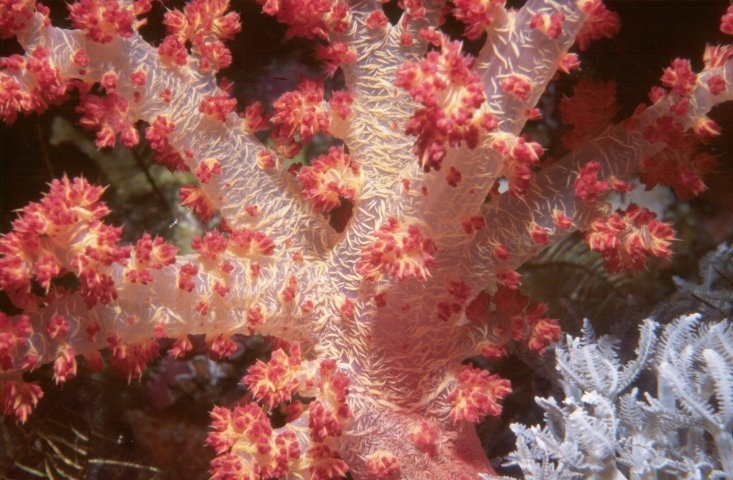 This includes hard and soft corals, sea fans, gorgonians, jelly fish and sea anemones. Amongst other common characteristics is the presence of stinging cells (nematocysts) which are used to catch prey. Eight feathery tentacles surround the coral's mouth and whip food into it. They filter-feed: removing plankton from water flowing around the colony. Relatively recent data on soft corals indicates that they feed on very small planktonic particles, such as single-celled algae, rather than larger larvae as had previously been thought.